Music is one of the world’s strongest forces. Melodies and rhythms have the ability to sway our very emotions. They change the way we view life and the situations around us. Lost In Harmony, the latest game from the creator of the highly rated Valiant Hearts: The Great War, is a rhythm game that uses a bunch of classic music (and one exclusive track from Wyclef Jean) in order to tell the story of Kaito and Aya. Aya, for reasons that are never directly explained, has been hospitalized with a disease and Kaito is trying to help keep her mind off of it. The story is told through a series of text messages which keeps the story in the background and the gameplay front and center. 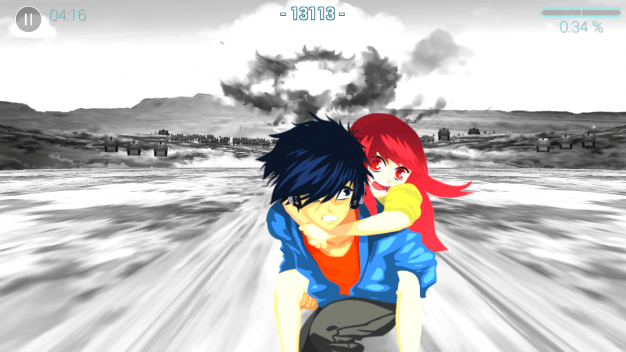 While using your fingers to tap and slide across the keyboard you guide a skateboard-riding Kaito, who is holding onto Aya, through a series of levels that start off fairly normal and change into something fantastic. The basic controls of the game having you tapping in some sections, sliding in others, and flicking the screen in order to keep your score up in order to move on to the next level. If you don’t score at least a 50% on a level the you have to try in all over again. Everything that is happening on screen with correspond with the music that is playing in the background. Learning the patterns in the music is essential to passing most of the levels. This is not the type of game you want to play on silent. The controls were fluid for the most part but there were several times that the motion control betrays the game and you end up crashing into everything you were trying to avoid. This is especially frustrating in the later levels when all hell is breaking loose. 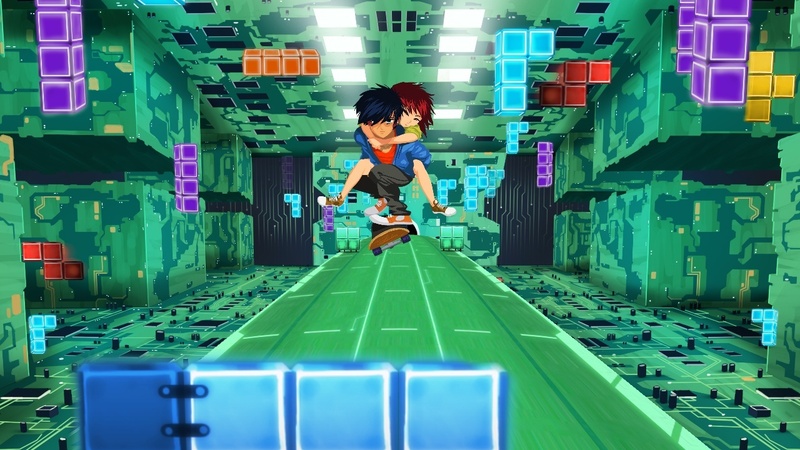 From the way that the game presents each level it is safe to assume that Kaito is dreaming everytime he is on his board with Aya. He, quite literally, looses himself in the harmony of the music that he is listening to on his headphones. He dreams of taking his friend who is already dealing with so much far away from this town. This world. Even this galaxy. He wants to show he every amazing sight he can think of, but I don’t think he does. It would be safer to believe that he never truly takes Aya anywhere. If she is as sick as the game suggest than she wouldn’t be allowed to leave the hospital, leaving Kaito to feel really helpless. The meaning behind Lost In Harmony is open to interpretation. 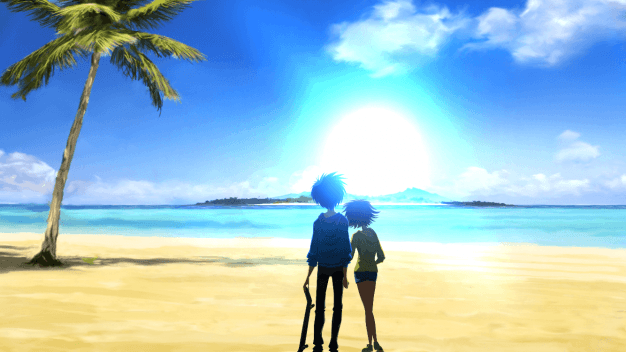 It feels like a journey that is built more towards helping Kaito cope with the situation at hand rather then helping Aya. The art style of the game has a very serious anime feel to it and in the middle of the game I started having Eureka Seven flashbacks. Digixart Entertainment did a fantastic job at bring a very touching story to life using as little dialog as possible. Along with 13 story missions, the game also comes with a level creator that allows you to use your own music to build games around. Not only that, but after you are done you can share them with the community and allow others to destroy their fingers while trying to keep up with the pace of your music. I never thought I would live to see the day I despised Coldplay so much. 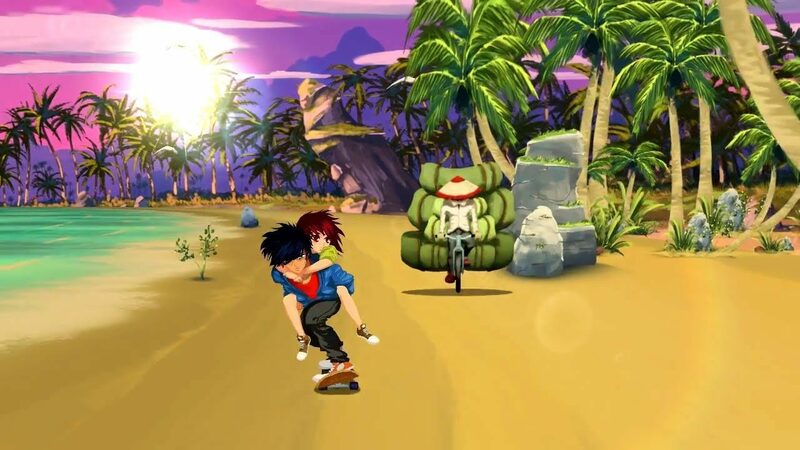 All in all, Lost In Harmony is a game that you have to experience for yourself. Its about a boy and a girl dealing with an impossible situation, and it’s beautiful.